- Cost wise, it's one of the most affordable vacations you can go on. With cruises starting around $50 a night including food and entertainment, it's pretty easy to understand their popularity. - You can see multiple places in a short period. 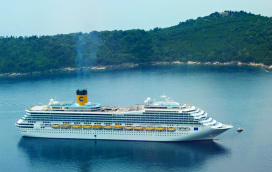 Most cruises have several ports of dock which allows you to experience the flavor of a few different islands/countries. - Cruises have many different activities like dolphin excursions, whale watching, scuba diving, and even rock climbing! Contact us for a quote or information on any cruise. We will not only match almost any price you find on the internet, we will beat it! There are quite a few different cruise lines to choose from. Royal Caribbean is one of the more popular ones. Carnival cruise lines are a popular choice amongst families and singles alike. They cruise all over the Caribbean, Central and South America and Fiji.